This was Duffy Brown at her best. This is probably my favorite cozy series. Reagan and her antics really keep a person entertained. Pearls and Poison is probably the best in the series yet. When Reagan's mamma is accused of murdering her opponent in the race for Savannah city Alderman, Reagan has to find the real killer. How one person can have as much trouble as Reagan, I'll never know, but it is hilarious and very entertaining. This series if filled with eccentric characters that embody the essence of the south. Throw in the chemistry between Reagan and Boone Walker and this is one great read. 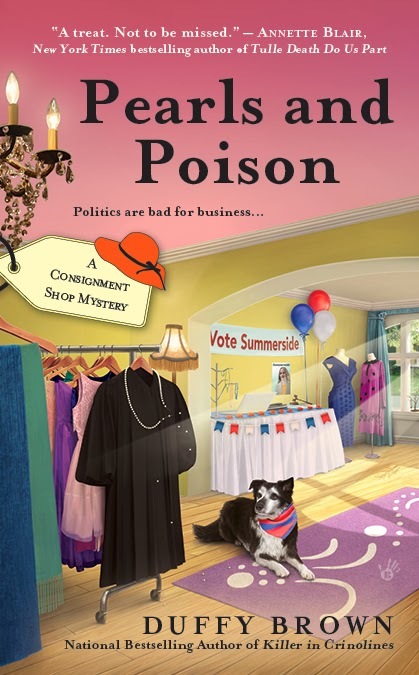 I cannot wait for the next book in the Consignment Shop Mystery Series. Please, Duffy, keep the laughs coming! Duffy has graciously agreed to give two Pearls and Poison Tote Bags per Blog Tour stop. To enter, leave a comment with your name and email address, so you can be contacted if you win. I will randomly pick a winner by next Monday, March 10. Good luck! 2. Who is the character Reagan based on, if anybody? The Consignment Shop series is a first person book so we see what Reagan Summerside sees, feels, eats etc. She’s recently divorced by a scum-bucket who kicked her to the curb for the young Cupcake. I think Reagan is so many people today. I wanted a heroine who was struggling to reinvent herself but someone smart and hard-working. Reagan is rehabbing an old Victorian herself and opening up a consignment shop to make ends meet. She gets sucked into solving murders to save her house or help a friend or her mom. I love Reagan because she never gives up. Things don’t always go her way…heck they rarely go her way…but she keeps at it and best of all…she has a great sense of humor through it all. 3. Since this series is about consignment shops, do you like to shop in consignment shops? I’ve worked in one for 17 years part-time. Write what you know so I did. Such great buys! I cannot see spending fifty bucks for a blouse when I can get it for five. 6. Besides writing, how do you like to spend your spare time? Hiking. Getting ready for a trip to Arches with my kids in April then off you Yosemite in September. Did Glacier and Zion and whitewater on the Grand Canyone. Wow!! 7. What is your favorite genre of books, besides cozy mysteries and who are your favorite authors? I’m a mystery girl. That’s it. If there’s no mystery I don’t read it or watch it. I love new Sherlock Homes on the BBC. Totally addicted. It’s smart and cleaver and ruins you for other shows. I’m also addicted to House of Cards. Wow! It’s TV crack. 8. Where is your favorite place to take a vacation? Anywhere I don’t have to cook. J But I do love the west. Utah is the nation’s best kept secret. The whole place is one big national park. Totally amazing. I’m blessed to have visited it. 9. If you could go anywhere in the world, where would you chose to go? I’d like to do the whitewater rafting though the Grand Canyon again and go back to Glacier National Park. As close to heaven as you get on this plant. Thanks for stopping, the giveaway is for a chance to win a Pearls and Poison tote bag. Him Melina. Thanks for have me. What a great site, so much fun and thank you so very very much for the terrific review. I truly appreciate it. Hugs. 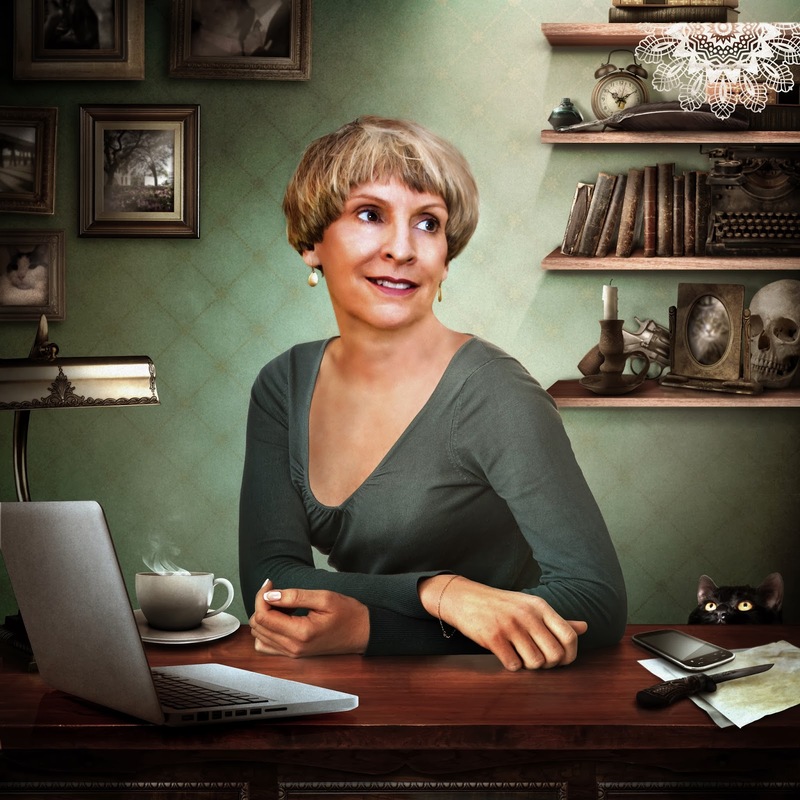 Wonderful being here at Melina's book blog and chatting with you all. The Savannah gang is up to it again with fun and murder and mayhem. Never a dull moment. Great interview and I'm look forward to reading this one! I just love cozies set in the South. Somehow, it just seems like such a relaxing, laid-back setting. I've seen several reviews now and want to read this book more with each encounter! Hah, can I reply to my own comment/ I'm also a new subscriber via Great Escapes Virtual Book Tours. Sounds great, and would love to win a copy.